It is not often that a brand-new poker format comes around. With the release of FlopOMania by 888, this has just happened. The idea of this game is simple… that if everyone gets to see the flop, there will be more action after it. To make this happen, 888 needed to dispense with the old system of blinds, and bring in an ‘ante’ instead. If that was not enough, then there are still plenty of no-deposit offers for new players at 888 Poker. The exact amount and terms does depend on where you live. This is up to $88 in tournament tokens and cash game buy-ins for some geos. 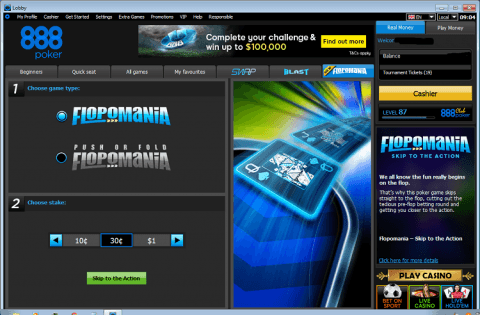 Check out the latest deal for where you live now at www.888poker.com! Find out when the next ‘Series’ starts, and claim your no-deposit needed bonus at www.888poker.com now! More Articles for Online Poker Fans!